Carolina Gorea! Congratulations to Carolina, the winner of the Career Training Winter 2012 Photo Contest! Carolina is a current Business Administration trainee in California. 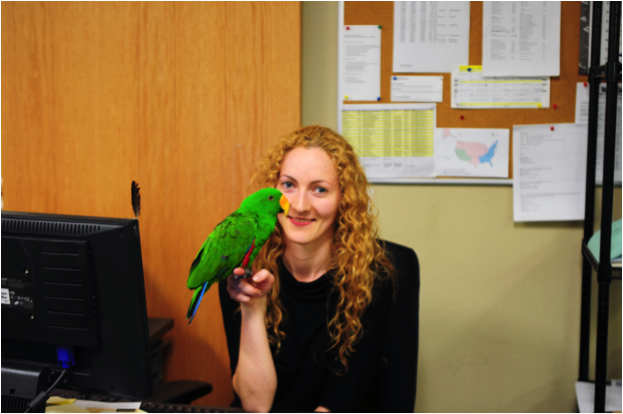 She is seen here taking a break with her "best friend at work," Sparky the Human Resources' parrot! As the winner of this photo contest, Carolina has won $75! Thank you to everyone who submitted a workplace-themed photo this winter. We enjoyed reviewing them, and all pictures will be uploaded to our Flickr and Facebook pages. Keep an eye out for our next photo contest this summer! In the meantime, like us on Facebook and follow our blog for helpful program information, fun U.S. travel tips, and upcoming events!